Listen to "Let Me Finish: Trump, the Kushners, Bannon, New Jersey, and the Power of In-Your-Face Politics" on your iOS and Android device. 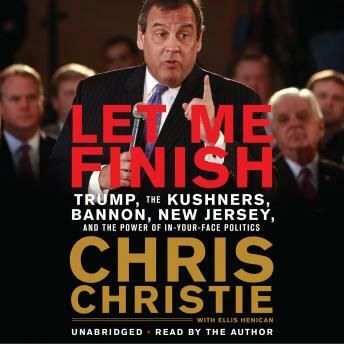 From the outspoken former governor, an 'explosive' (Guardian) 'must read' (Hugh Hewitt) account of Chris Christie's life in politics including his eye-opening insights into Donald Trump -- 'you will like the stories he tells' (Brian Kilmeade). Very good book, like how governor Christie approach’s politics .Also love how he puts family first before politics!